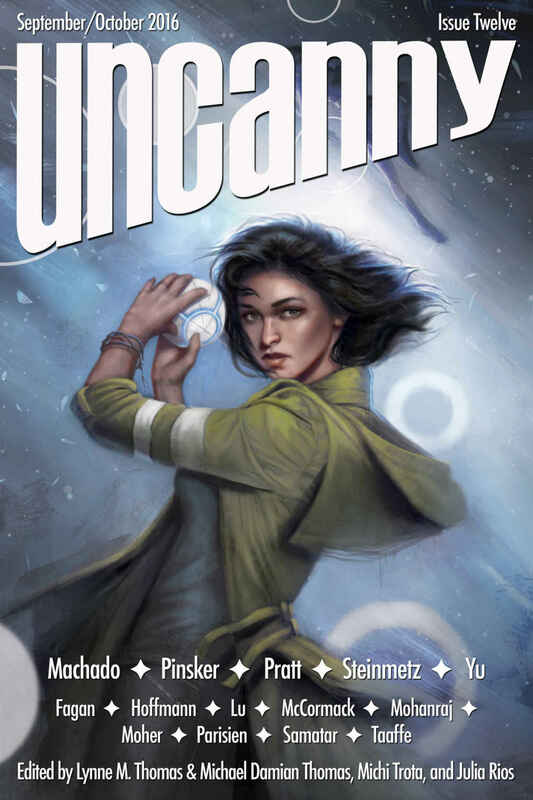 "The Witch of Orion Waste and the Boy Knight," by E. Lily Yu [bio] (edited by Lynne M. Thomas and Michael Damian Thomas), appeared in Uncanny Magazine issue 12, published on September 5, 2016. Pro: The hallmark of the young witch is that she's never satisfied with her life. She leaves home for the chandler's, leaves him to be a witch, leaves that to hunt dragons, leaves the knight to go back to the chandler, and flies somewhere unknown to learn to dance. In a way, she's a bit like the women with the hole that could never be filled. The young knight never grows up, and that's partly her fault. He needed to actually face some dragons on his own, but by protecting him from them, she inadvertently dooms him. He ends up a plaything (literally) for the woman with the hole. Con: The story is inconclusive. We're not really sure what the girl is doing with those blood-stained shoes. (They sound like a relic from a different fairy tale). Ah yes. And she gets them from a "a peddler with a profitable knack for roaming between stories," which explains a few things. I wonder what the point of the "three cakes of soap, three spools of thread, three needles, a mirror, and a comb" that the shopkeeper gives her is?
" I wonder what the point of the "three cakes of soap, three spools of thread, three needles, a mirror, and a comb" that the shopkeeper gives her is?" Well, the story is 2 years old next week, so if we don't know by now, I'm afraid we may never know--unless someone asks the author.